ChiIL Mama : GIVEAWAY: WIN 4 Tickets (Up to $68 Value) to the World Premiere of Lucas Baisch’s Roots in the Alley at Adventure Stage Chicago 4/6-5/5! GIVEAWAY: WIN 4 Tickets (Up to $68 Value) to the World Premiere of Lucas Baisch’s Roots in the Alley at Adventure Stage Chicago 4/6-5/5! I'll be ChiILin' with Chi, IL's Adventure Stage Chicago (ASC) for the press opening of Lucas Baisch’s Roots in the Alley on April 7th, so check back soon for my full review. ASC has long been a favorite of ours and we adore their neighborhood outreach and multicultural flavor. 4 Tickets (Up to $68 Value) to the World Premiere of Lucas Baisch’s Roots in the Alley at Adventure Stage Chicago through 5/5! Enter through midnight 4/4/18. Winner's choice of show dates/times except the press opening, pending availability. Adventure Stage Chicago (ASC), a program of the Northwestern Settlement, presents the world premiere of Lucas Baisch’s Roots in the Alley from April 6th to May 5th, 2018 (press opening April 7th) at the Vittum Theater, 1012 N. Noble Street. Inspired by his Guatemalan roots, Baisch’s new play reinvents Mayan creation myths through the story of two heroic Chicago sisters who navigate through an online game, learning about their heritage and family along the way. Tickets range from $7 to $17 and are available now at adventurestage.org or by calling 773-342-4141. Roots in the Alley is ASC’s first play to benefit from a new play development process formalized by ASC Playwright-in-Residence Carlos Murillo. ASC and Baisch worked side-by-side with school, youth and community groups at Northwestern Settlement over 12 months, using their input and participation to integrate community stories into the world of the play. The resulting story about heroic youth amplifies the mission of the Settlement, educating and inspiring its community to help disrupt generational poverty in Chicago. “What first drew me to Lucas’ work was his interest in creating unique universes. World-building is incredibly important to the creation of work for younger audiences, and I’m excited to work with a playwright who naturally starts from this place. This is also the first play we are producing with Carlos in residence, someone who both gives the organization an important perspective on how to successfully engage playwrights as well as giving future playwrights a way into our process,” says ASC Producing Artistic Director Tom Arvetis. 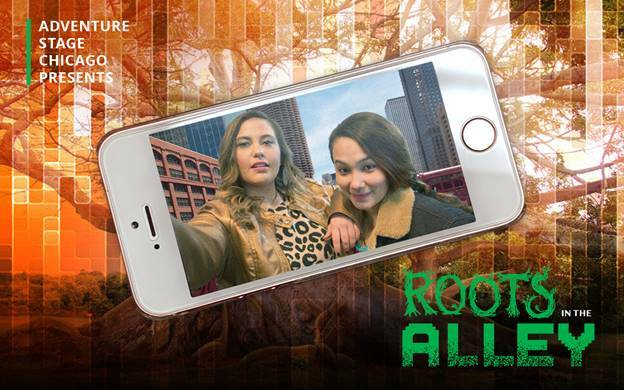 Roots in the Alley tells the story of Honey and Blanca, twin fish out of water in Chicago until they stumble into the Ceiba Network, an online game with real world consequences. The hero sisters struggle to level up in a mysterious digital underworld where they discover something strange to them—a heritage worth fighting for. As they progress through the game, they realize it has strange parallels with their own lives. In Roots in the Alley, Lucas Baisch reinvents the Mayan creation myths of The Popol Vuh, provoking questions about history and heritage. ASC Playwright-in-Residence Carlos Murillo and Producing Artistic Director Tom Arvetis were creative advisors for this project. Previews: Saturday, March 31 at 4 p.m.; Friday, April 6 at 7 p.m.
Press Opening: Saturday, April 7 at 4 p.m. Regular Run: Saturdays April 14 to May 5 at 4 p.m.; Friday, April 20 at 7 p.m.
Lucas Baisch is a playwright and visual artist of Guatemalan, Mexican, and German descent originally from San Francisco and now based in Chicago. He is currently under commission as a member of the Goodman Theatre's 2016-17 Playwrights Unit. His work has been read and developed at Chicago Dramatists, InFusion Theatre Company, Salonathon, Victory Gardens Theater, Links Hall, Gloucester Stage, American Theater Company, The NeoFuturists, The Wulfden, The DeYoung Museum, SF Playground, and DePaul University’s annual Wrights of Spring. Productions: The Scavengers (The Healy Theater at Depaul University), A Measure of Normalcy (Gloucester Stage Company), and Zipped & Pelted (The Wulfden/Chicago Fringe). He has served as the Gloucester Stage Company's 2015 Playwriting Apprentice and will be a 2017 artist-in-residence at Elsewhere Museum in Greensboro, NC. Education: BFA Playwriting, DePaul University. Carlos Murillo is a Chicago-based, internationally produced and award-winning playwright of Colombian and Puerto Rican descent. He is a recipient of a 2015 Doris Duke Impact Award for his work in the theatre. His body of work has been widely produced throughout the United States and Europe. His best-known play Dark Play or Stories for Boys premiered at the Humana Festival at Actors Theatre of Louisville, and has been performed throughout the world. His other work has been seen in New York at P73, the NYC Summer Playwrights Festival, En Garde Arts, The Public Theatre New Work Now! Festival, and Soho Rep, in Chicago at the Goodman, Steppenwolf, Collaboraction, Walkabout Theatre, Adventure Stage and Theatre Seven, and in Los Angeles at Theatre @ Boston Court, Circle X and Son of Semele. The Javier Plays, a trilogy of works was published by 53rd State Press. Other forthcoming publications include Mimesophobia (Broadway Play Publishing) and his TYA play Augusta & Noble (Dramatic Publishing). Carlos heads the BFA Playwriting Program at The Theatre School of DePaul University.